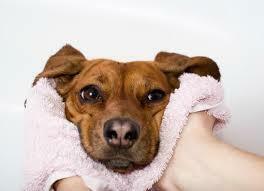 Fleas can cause a lot of problems for a dog and its owner. These tiny pests can thrive on your pet's body laying their eggs all the time. They can cause the poor dog to persistently itch and if he has an allergy to fleas, he could lose his fur, continuously itch to desperation, and can result to inflammation or infection. Despite whether or not the dog has an allergy, these pests have to be controlled or they can thrive in him forever. The fleas might also dominate your household, other pets, and even begin jumping on people. To sum it up; flea infestation can drive you as well as your dog totally crazy if not promptly and effectively taken care of. If your dog is always scratching or you can sense some things moving in him and you suspect he has fleas, there are means for you to know for sure. Fleas are extremely small (approximately 1/8 of an inch in length), but they can be seen with the naked eye, and they have a brownish color. You are most likely to find them underneath the dog's coat and collar, as well as the belly. The numerous black specks or flecks, which are almost identical to pepper, also found under the coat are actually their waste materials. If you can find fleas or their wastes, then your pet is due for flea treatment to exterminate these parasites, and the sooner it is done the better. There is a variety of flea treatment for dogs in the form of sprays, powders, liquids, and flea collars. These treatments are effective in eliminating flea infestation to a certain extent. If by now, however, your dog has fleas, then they are not going to be very effective. Once your dog has fleas, the female fleas can lay about 30 eggs per day. The eggs eventually hatch, causing your flea dilemma to escalate into a full-scale flea invasion, and it can infest your dog over and over again. Your goal is to kill not only the mature fleas but their eggs and larva as well, in which oral medication might prove helpful. Oral medication will end their life cycle and prevent them from re-infesting your pet over and over again, thus putting your mind at ease. You also need to clean the area/areas where you suspect these fleas come from and where they are likely to fall off, from your dog including the carpet, bedding, and all the other areas he wanders into. Fleas are a real nuisance not only for dogs but for their owners as well. It is important that you catch these pests and treat your dog as soon as possible to keep them from coming back and to put an end to your problem. The solution? Dog flea treatment. Know how to get rid of fleas on dogs here!